For people in the market for a sports coupe, Hyundai isn't usually one of the first automakers to come to mind. But since going on sale in 2010, the Hyundai Genesis Coupe has made a name for itself as an able sports car, if one that many buyers don't consider. The Genesis Coupe competes against the likes of the Ford Mustang and Chevrolet Camaro, and many buyers plunk down cash at a Ford or Chevy dealership before even looking at the Hyundai—if they even know it exists. That shouldn't be the case. The Genesis Coupe returns for 2016 largely unchanged. And by largely, we mean almost completely—the only difference between the 2015 and 2016 is a new 6-inch color display in the dash. This is both a good and a bad thing. While the Genesis Coupe could indeed use an update in the looks department, we're happy to hear the car's driving dynamics haven't changed—we test-drove a 2015 and loved it; it's one of the most fun-to-drive cars on the market today. Like the 2015 model, the 2016 Genesis Coupe comes in three trims—3.8, 3.8 R-Spec, and 3.8 Ultimate. As you can guess from their names, all versions of the Genesis Coupe rock Hyundai's powerful 3.8-liter 6-cylinder engine, pumping 348 hp to the pavement via rear-wheel drive (RWD). That engine is mated to a standard 6-speed manual transmission, although an 8-speed automatic is available for $1,200 on the 3.8 and 3.8 Ultimate (the R-Spec is manual-only). Trims with the manual return fuel economy numbers of 17 mpg city/24 highway/19 combined, while the automatic registers 16/25/19. While its great driving is what mainly sets the Genesis Coupe apart from the competition, its interior qualities help do that as well. Hyundai's engineers did a great job with the cabin—for the driver, that is. Up front, the driver's seat offers visibility unmatched in the segment. In the back, though, the seats are quite cramped, meaning you can fit 2 adults comfortably up front and 2 uncomfortably in back. The rear seat does fold down, however, allowing additional access to the 10-cubic-foot trunk. Hop into the base 3.8 and you'll get your choice of black cloth seats or gray cloth seats with gray leather bolsters. On the inside, you'll also find a 6-inch color infotainment display hooked up to a 170-watt 6-speaker sound system, SiriusXM satellite radio, Bluetooth connectivity, automatic climate control, push-button start, and a 6-way adjustable driver's seat. On the outside, expect 18-inch alloy wheels, automatic headlights, and a sport-tuned suspension. Move up to the 3.8 R-Spec and those seats become black cloth seats with black leather bolsters. Other features include those found on the 3.8, plus sport seat bolsters and Brembo brakes. Hitting the top of the range, the 3.8 Ultimate sports an impressive 7-inch touchscreen navigation system, along with your choice of black or tan leather. Also included on the 3.8 Ultimate are a power moonroof, heated front seats, Hyundai's Blue Link telematics system, a power driver's seat, parking assist, and a 360-watt 10-speaker Infinity sound system. A body color spoiler and Xenon headlights are added to the exterior. On the safety front, all versions of the Genesis Coupe come with standard electronic stability control and traction control. Also standard are 4-wheel antilock brakes with electronic brake-force distribution and brake assist. Inside, all trims boast dual front airbags, front side airbags, and front side-curtain airbags. All trims with the 6-speed manual also come with Hyundai's Hillstart Assist Control. 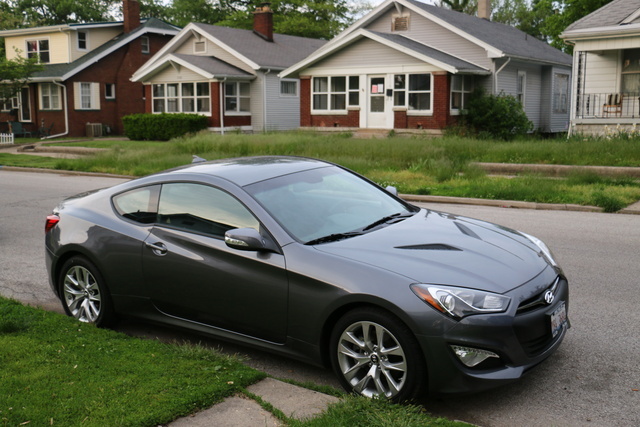 If you're in the market for a sporty 2-door, take a serious look at the Hyundai Genesis Coupe. Sure, it's up against some stiff competition and is overdue for a serious update, but it's a fun little car with some real spirit. Hyundai's 10-year/100,000-mile powertrain warranty doesn't hurt either. 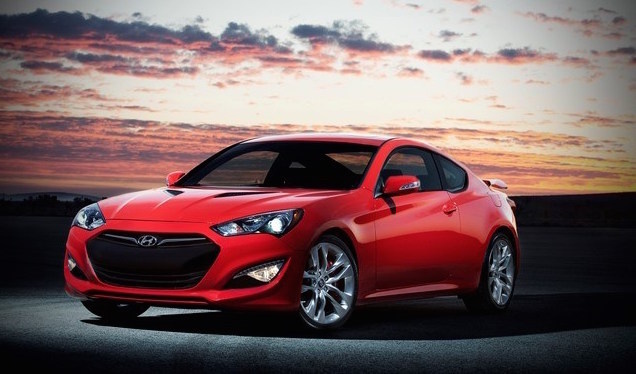 What's your take on the 2016 Hyundai Genesis Coupe? Users ranked 2016 Hyundai Genesis Coupe against other cars which they drove/owned. Each ranking was based on 9 categories. Here is the summary of top rankings. Have you driven a 2016 Hyundai Genesis Coupe?